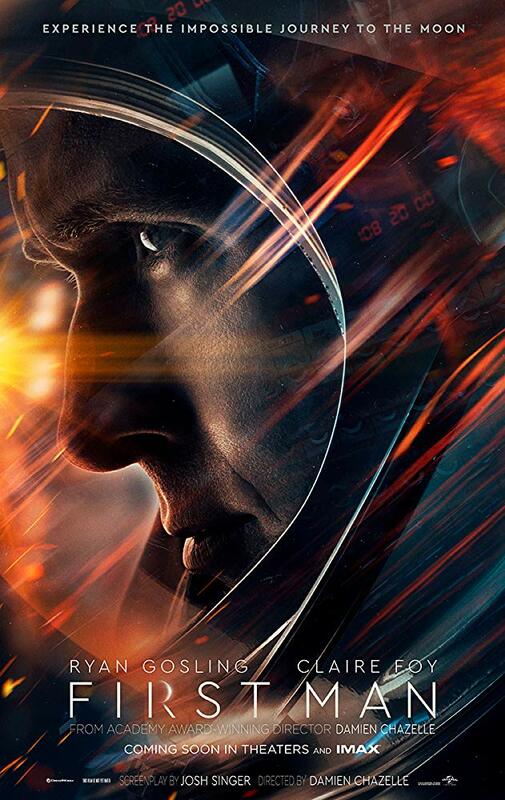 Venice Film Fest 2018–Thought it’s only August 30, I am making a wishful proposition (hopefully a correct prediction) that the multi-talented Claire Foy should receive a lead Oscar nomination for playing the difficult, demanding and commanding role of Janet Armstrong, wife of Neil Armstrong (played by Ryan Gosling) in Damien Chazelle’s dazzling space epic, First Man. I saw the film two days ago (before the festival began) and what lingers in my mind, alongside the detailed chronicle of the first US landing on the moon and stunning spectacle, is the domestic story of the personal and family life of the Armstrongs during crucial and tumultuous years (1961 to 1969) leading to the climactic event. For me, equally interesting, and emotionally more touching, is the deconstruction of a “typical” (sort of) marriage in small-town America, Lebanon, Ohio. It’s established in the first scene that the couple lost their young daughter after battle with cancer, a loss that Neil could never recover from. In some ways, he challenged himself and risks his life by going to the moon in order to be able to come back to earth as a more balanced and mentally healthy husband and father. (The couple produced another boy soon after their daughter’s death). We have seen Claire Foy doing good work on TV (The Crown), for which she won the SAG and Globe Awards. But her complex role in First Man represents her most subtle, multi-nuance, fully realized performance to date. Since Neil was quiet, private, and mysterious, laconic in words and keeping to himself, it’s his wife who does most of the talking. It’s a credit to scribe Josh Singer and director Chazelle that they grant Claire the extra-treatment she deserves, via lengthy close-ups. Wearing no makeup, and dressed in ordinary wardrobe, Claire is still a beautiful woman, and when she’s onscreen she is riveting, commanding her family as well as our attention. Janet is stronger than Neil: She comes to terms with her loss more quickly than her husband, and while she supports Neil’s life-threatening missions, she demands that he takes his share and responsibility in raising their two boys. In the film’s most emotional scene, Janet asks Neil to speak directly to his boys and tell them the truth, that he might never come back home. At first, Neil is hesitant and non-responsive, just sitting in silence, but she repeats her demand three times—until he consents. Janet is also a woman who insists on having a life of her own: she is not your “typical” suburban wife, committed (in both senses of the term) to domesticity. She enjoys and takes pride in her position as swim instructor. She is also supportive of her peers, other women in her neighborhood, who had already lost their husbands and are raising their children alone.